Made with ultra-light cushioning to minimise weight, and for closer, more direct contact with your running shoes, Falke RU5 Invisible Performance Running Socks are performance sportswear with Falke’s patented anatomical left/right specific fit, shaped arch and a three-layer construction open mesh structure weave for greater breathability and extra-fast moisture wicking. The protective cushioning is targeted directly where it’s needed, so Falke RU5 Invisible Performance Running Socks are cushioned at the heel and ball of the foot, with protective pads at the front and back of the cuffs and an elasticated instep band. 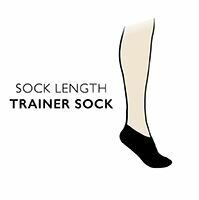 A pocketed heel improves the fit and helps against the socks slipping during activity.